The big picture approach to disaster relief and recovery. 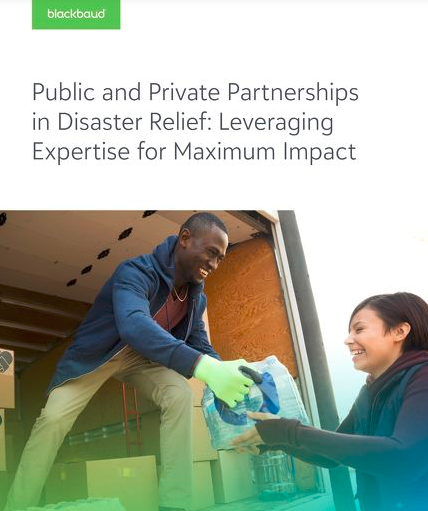 In this ebook from Blackbaud and the Center for Disaster Philanthropy, we explore disaster relief in four buckets: examining response on the ground in disaster-struck areas, collecting support, distributing support, and strategizing for the future. A key theme that is prevalent in each of these buckets and critical for the success of provided aid is the existence of partnerships. With disaster and humanitarian relief, it is all about who can communicate the needs of the affected areas and deliver the aid the fastest, and this can change depending on the type of natural disaster and where it hits. First, plan ahead. Set aside money now for planning, recovery, and immediate relief. Your efforts before and after a disaster can make a big difference in the amount of destruction and the number of deaths that occur. Second, think holistically. How can your employees and skill sets—as well as your cash and products—make a difference? The Disaster Philanthropy Playbook offers guidance on how you can effectively allocate resources to disasters. Third, support collaborative prevention and mitigation efforts. Just reacting isn’t sustainable or strategic. The future of our communities depends on collaboration and creative thinking about prevention, mitigation, and adaptability. Our entire selection of disaster relief resources can be found here, and you can hear Bob and others speak to disaster relief at this year’s bbcon. Blackbaud’s annual conference will be held in Orlando on October 9th-11th, and we encourage you to join us to continue the conversation around collaboration. Attendees will be representing companies, nonprofits, foundations, community foundations, and more.